CHAIN OF LAKES GORGEOUS waterfront home directly on Lake Minnehaha! 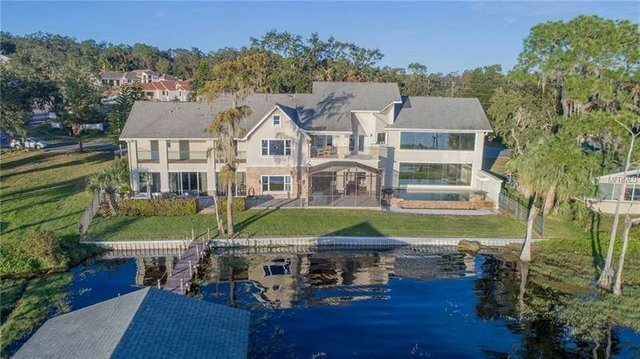 Spend your days fishing or boating and evenings watching gorgeous sunsets as the sun drops across the lake.This massive home has 6 bedrooms plus office,dual master suites,porches and balconies across the rear of the home.This fabulous infinity edge pool w/ firecolumn water features,rain curtain w/sitting ledge PLUS the granite topped barstools IN THE POOL as you are served drinks from the interior sunken bar!No need to leave for getaways,this is vacation everyday!Covered boat lift PLUS a separate screened covered porch on the dock.Have your friends pull up on their boats,come in and enjoy all this home has to offer.Entertaining dream!MASSIVE game room w/seamless windows overlooking the lake,that sunken bar, PLUS a home theater area! Formal living room w/access to porches, formal dining room off the kitchen PLUS eat-in area in the kitchen for the more casual meals.Dual master suites upstairs,the main master is absolutely incredible.Views and sunsets galore from the wall of seamless windows,plus a massive sitting area,covered porch and open balconies.Master bath has huge walk in shower,jetted tub,steam room and huge,dual walk in closets.Your own personal coffee/tea area so you can wake up, relax in the morning and start the day at your own pace!NO HOA/deed restrictions!If you think you have seen this home from the road,or online a previous time,you have NOT seen it until you go in and take in all in. Near Orlando. See interior/drone video.